Lamb Stew Recipe with deep rich flavor and hearty ingredients! This is a simple one-pot meal that’s started on the stove-top and finished in the oven. Slow cooking the lamb makes for tender morsels and vegetables that will melt in your mouth! Lamb Stew Recipe slow cooked with hearty delicious flavor! You guys know I shop at the farmers market often, I’m sure! It’s something I talk about all the time. On Wednesday when I don’t make it to the farmers market, I swing by a corner stand near our home to get fresh produce. This time of year what I’m looking for are the figs. It’s no secret, I love figs! Even Black Mission Fig Ice Cream! and one more recipe from Valley Fig – California Dried Fig and Apple Stuffed Pork Loin – perfect for fall! Anyway, last week I stopped by the corner stand (again!) and I was speaking with the owner. She’s seen me every week grabbing bags of figs and I was telling her how much I loved figs and what I was making this week. 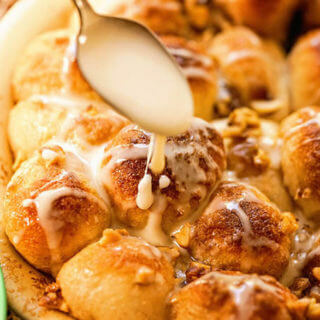 So it’s only fitting that today I get to share with you a delicious new recipe that coincidentally…. uses figs! 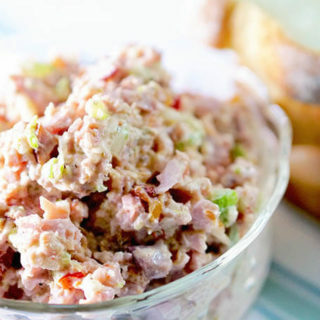 This recipe is simple to make and full of big hearty flavor! 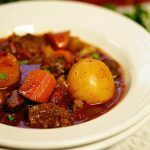 This lamb stew recipe is one of those meals that if your husband, wife, kids, boyfriend, girlfriend – whoever walks through the door doesn’t exclaim “oh my gosh, what’s for dinner” seriously rethink that relationship! This stew is that good! What cut of lamb is best for stew? I suggest using lamb shoulder, chops, shank or leg. For this lamb stew recipe I used a shoulder cut. I do not use stew meat. I kind of think of that as mystery meat. Pro tip! If you ask nicely your butcher will happily trim and cube the meat for you! Is Lamb supposed to be chewy? Nooooo! If you pull this stew out of the oven and the lamb isn’t spoon tender, it hasn’t cooked long enough! 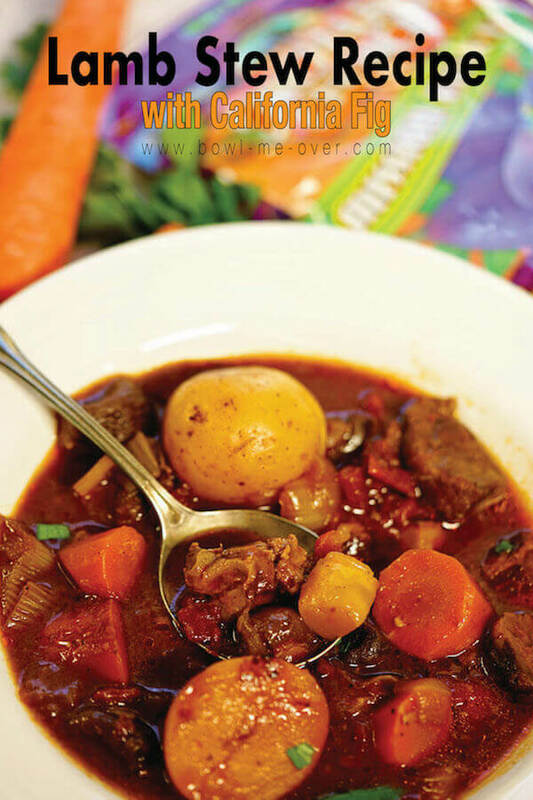 After slowly braising in the oven, the meat in this stew is fall-apart tender and delicious! Can I make Lamb Stew in the Slow Cooker? You bet! But you’ll want to start it on the stove-top, follow steps 1-9 THEN scrape everything into your slow cooker, being sure to get all the brown bits off the bottom of the pan. Add the remaining ingredients. Cook on low 8-10 hours until the meat is fall-apart tender. I also have a great post for grilled lamb chops. If grilling chops are intimidating, click here for my best tips! 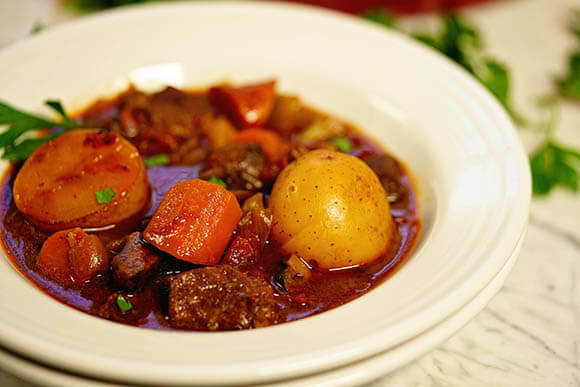 Grab your spoon, because you will definitely enjoy this stew! Why do figs and lamb go so well together? Lamb and figs are both super rich and have big flavor. Together the combination is outstanding! Earthy and hearty flavors combine for a rich meal that’s easy enough for a beginner to make and shine like a star at mealtime! Braising the figs and sautéing them in red wine incorporates the flavors for this hearty stew. 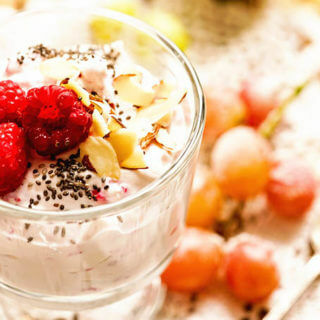 Find information on Fig Nutrition here. Mix the flour and seasonings together in a large plastic bag. Add the cubed lamb, toss to coat. Clean, slice and dice the vegetables. Remove the stem from the dried California Figs and slice them in half. Render the fat from the bacon. When crispy, remove from pan. Add a tablespoon of olive oil and the lamb/flour mixture. Sauté until the lamb cubes are golden brown, remove them from the pan. Next, add the tomato paste and figs and “toasting” the tomato paste and figs. Add the wine and diced tomatoes. Scrape the bottom of the pan to remove the brown bits. Add all of the remaining vegetables. Return the lamb and bacon to the pan. Top with the beef broth and give it a stir to combine. 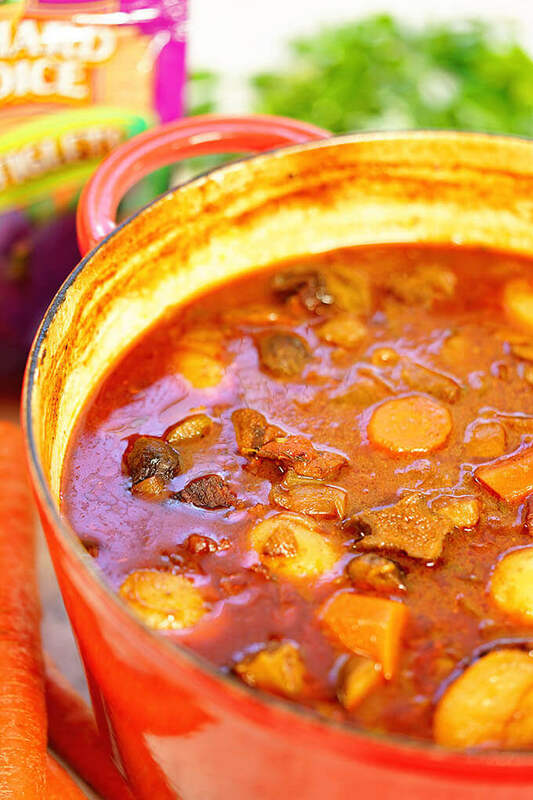 Super rich and hearty this stew has amazing flavor! More Big Hearty Soup and Stew Recipes! Lamb Stew Recipe with deep rich flavor and hearty ingredients! 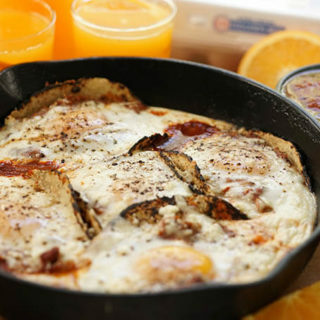 A simple one-pot meal started on the stove-top and finished in the oven. 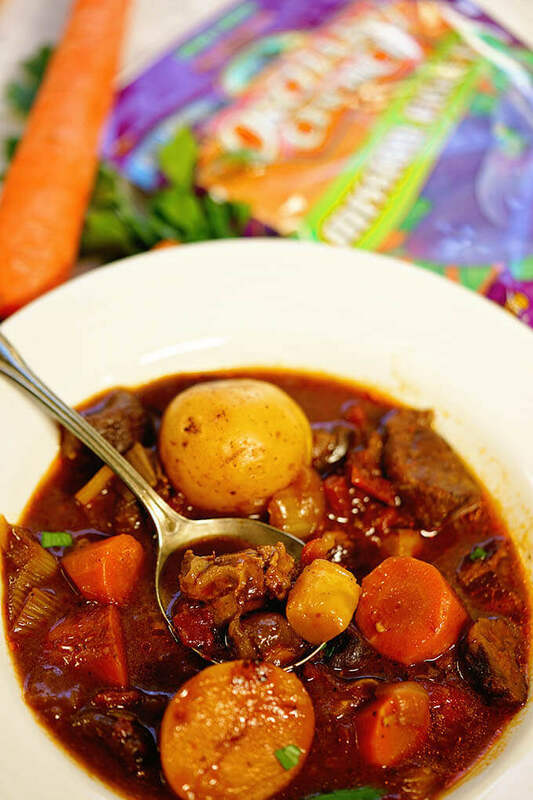 Slow cooking makes for spoon tender meat and vegetables that will melt in your mouth! Mix together the flour, Italian seasoning, salt and pepper in a large plastic bag. Add the cubed lamb to the seasoned flour massaging it into the meat. Set aside while you prepare the remaining ingredients. Clean the mushrooms, slice them in half. Dice the onions and slice the celery and carrots. Clean the potatoes and slice them in half. In a large heavy bottom pot on the stove, start by rendering the sliced bacon over medium heat. (Starting it in a cold pan on the stove will allow the fat to cook off.) This takes about 10 minutes. When the bacon bits are crispy, remove from the pan, set aside. After you've removed the bacon bits from the pan add a tablespoon of olive oil. Add the lamb/flour mixture. Pour it all into the pan. Spread it in an even layer and cooker until the lamb cubes are golden brown. Remove them from the pan. Next add the tomato paste and California Figs to the pan, scraping the bottom of the pan and "toasting" the tomato paste and figs. Now add the red wine and can of diced tomatoes. Scrape hard to get all of those brown bits off the bottom of the pan! That's your flavor! Now the hard work is done! 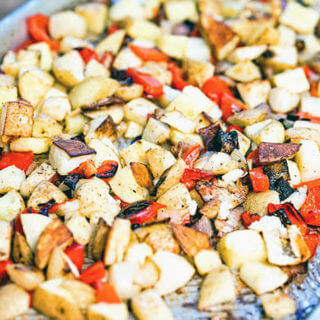 Add the remaining ingredients: Potatoes, carrots, celery, mushrooms, garlic and onions. Return the lamb and bacon bits to the pan. Top with the beef broth and give it a hefty stir. Cover tightly and place it in the preheated oven for 3 hours. As you can see from the pictures, the meat and vegetables are big hearty chunks. Keep them in larger pieces. Do not mince or thinly slice. Because this meal simmers for several hours if you dice everything too finely it will dissolve into the stew. Lamb is so yummy and I love the chunky vegetables in this! You’re welcome Liza – enjoy!! We were given a few packages of lamb a little while ago and I didn’t know how to prepare it. Well, now I know!! Thanks for a great recipe! 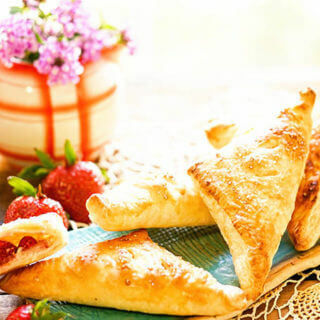 I just love this recipe, I hope you do too! Thank you Malinda! I was looking for a hearty stew recipe and this was so delicious! Perfect for those chilly nights that are already here! My wife made this for our family the other night. I was hesitant because it had lamb in it but we all loved it! That’s wonderful I’m so glad you kept an open mind and enjoyed this meal! What an amazing flavor combo! This sounds like something that should be on the menu at a fancy restaurant!